The introduction of sit-to-stand workstations has resulted in the workplace community debating if standing is now the alternative to sitting at work. This debate is not well founded when the benefits of frequent changes in posture and using blood flow to maintain physical and cognitive health is the key outcome required. The term “dynamic work” should be the focus of the debate to encourage workers to change their working postures and activities to generate greater blood flow and dissipate static muscle loading. This should be discussed within a broader health debate in relation to the prevention of cardio vascular and obesity for sedentary workers. This is part of a focus on general health and wellbeing at work. Dynamic work is not about sitting or standing; it includes both of these postures as well as a broader understanding of the job design. A review of workers activities in post occupancy assessments of new office fitouts indicated that approximately 50% of workers to do not adjust their sit-to-stand workstations but leave it at a seated height at all times. These workers explained that their job design requires them frequently to change posture including getting up and walking around. They achieve the benefits of dynamic work through their multi task job design. 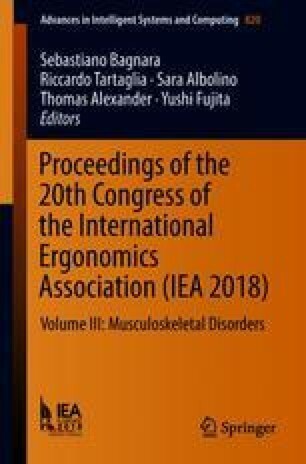 Approximately 40% indicated that they will use the adjustment mechanism to change the workstation height between sitting and standing during the day however they were less likely to use the adjustment mechanism if it was noisy or slow to adjust. The actual timing and duration of the sitting or standing depended on their physical, cognitive and psychosocial needs of the worker. Findings also revealed that approximately 10% of workers preferred to stand at their workstations all the time. This cohort of people included workers with injuries who indicated that prolonged sitting aggravated their condition. It also included workers who regularly sat in meetings and preferred to stand when they returned to their workstation for a change in posture. There were also injured workers who use the sit-to-stand adaptor units on their fixed height workstations if they were recovering from an injury. Evidently the design of some adaptor units presented MSD risks due to the amount of force and the elevation of the shoulders required to adjust these unit. In relation to training it was found that the introduction of sit-to-stand workstations required specific guidance on how to achieve dynamic work. The training should also develop skills to relieve lower back and lower limb fatigue from prolonged standing. This is particularly important when the hands are in front of the body’s centre of gravity to work on a keyboard and mouse on the work surface. Further research is required pre and post relocation to sit-to-stand workstations to assess the health and wellbeing impact on the workers as well as the impact on their productivity and cognitive demands.